First gently toast the pine nuts in a dry frying pan on a medium heat taking care not to let them brown too much. Once lightly toasted on both sides remove from the pan to a plate and allow to cool. Place the garlic, a pinch of salt and pepper and the basil leaves in a food processor and pulse for a minute or so until finely chopped. Add in the pine nuts (you can save a few for scattering over if serving with pasta) and parmesan and with the processor on automatic and gently drizzle in the olive oil to the consistency that you want. Taste and if necessary add more salt and pepper or more parmesan if required. 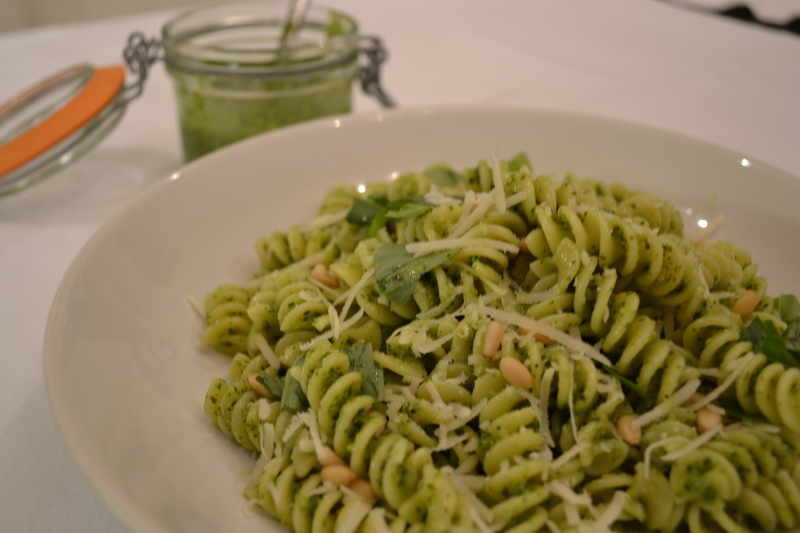 If you are using all of the pesto to coat pasta then just add to drained cooked pasta and stir well. You can keep pesto in a sterilised jar in the fridge for a few days – drizzle the top with a thin layer of olive oil to keep it fresh. You can make a rustic pesto using a pestle and mortar instead of the food processor – just bash the garlic with some salt and pepper, add in the basil, pine nuts and parmesan and bash until you have a very rough paste and then add in the olive oil mixing all the time. Roasted Tomato and Basil SoupIn "Soups"
so funny that you posted this today. im having pesto with tortellini for dinner tonight!